Why wind? As a giant wind-farm opens in Scotland, it should be obvious that wind power is not the future of energy supply in Britain or anywhere else. Wind-turbines are expensive and inefficient, they ruin the landscape, they are noisy when they work (which isn't very often) and they kill birds. In Taiwan, noise pollution from a wind farm has been held responsible for the death of four hundred goats. The amount of electricity they generate, even now, is negligible. It is said that the vast new Eaglesham Moor plant could potentially power the whole of Glasgow - but that is only when it is operating at full capacity, which even in a country as windy as Scotland is not even half the time. Even as the new plant opens, plans are announced to expand it still further (although it already covers 55 sq. km), while over in Shetland an even more elaborate wind-power scheme is attracting increasing opposition. A BBC report quotes Professor David MacKay of Cambridge, who said that a "100-fold increase" in wind farms in Britain would be necessary to achieve the government target of a complete decarbonisation of our electricity supply system by 2030. The only other alternative to carbon generation he mentioned was nuclear power - itself an outdated and non-renewable technology that brings with it its own problems. Global warming is real and deadly and we have to do our best to counter it but we must not be led astray by the special pleading of an industry made rich by over-generous subsidies paid for by your taxes and one that is bound to fail to deliver. In Germany, Lovelock reminds us, "despite more than 17,000 wind turbines across Germany the nation is emitting more CO2 than before it built them". With only 17% efficiency, the wind farms have to be supplemented by more conventional (carbon-emitting) sources of energy generation which themselves are prevented from operating at their maximum efficiency because they are working in tandem with the turbines. Germany is becoming dangerously over-reliant on wind power, a path Britain and even the US look set to follow. Indeed, the National Audit Office calculated in 2005 that wind was the most expensive way to fund carbon emission reductions in Britain. It gave a figure of £70-£140 a tonne of carbon saved - even more than the figure for Germany. Needless to say, such findings have failed to make much impact on the drive for wind-power in either country. It's not as though there aren't alternatives. There are far more efficient and less environmentally damaging technologies available and soon-to-be available. Tidal and wave generation offers far more power without the inherent unreliability of the wind. Best of all, they are hidden. The plants may cost more to build than wind-farms but, being more efficient, will save money over the long term. Geothermal energy may be even better. This taps directly into the inexhaustible energy of the earth itself, and (technicalities aside) consists of little more than a hole in the ground. It has almost no environmental costs. Looking further ahead, but not too much further, a more reliable source of wind-power - and one far less destructive of the environment - may be had by tapping into the jet stream of the upper atmosphere. Then there is carbon capture, which would enable the substantial surviving reserves of coal to be exploited at little or no environmental cost. Some of these options are being explored, but the need to do something right now - to demonstrate steady progress towards ambitious targets - means that resources are concentrated disproportionately towards the dead-end of wind power. Long-term, this will mean that the targets are less likely to be met. Certainly, they will be difficult to meet without massive expense, waste and disruption. An alternative strategy of investing in the truly sustainable technologies of the future, would produce less immediate progress but, once in place, the gains would be real and lasting. Today's wind power is a stop-gap, but the damage it does to the environment will be irreversible. So why is the government, the environmental movement and so much of the public discourse wedded to this wholly irrational strategy? Clearly, money has a great deal to do with it. On the time-honoured principle of throwing good money after bad the huge resources, both private and public, already "invested" in wind power must be justified by being increased. Figures released to Parliament in 2007 show subsidies rising to over £1 bn by 2012. Diverting resources into other types of renewable energy would mean writing off substantial sums, which would be embarrassing all round. Better to keep on wasting the money. Wind power was first on the scene, which means that it now supports an entire industry of designers, propagandists and assorted experts. With lavish subsidies on offer, it is in the interest of power companies to exaggerate wind power's potential. Wind farms - even if built in the wrong place - represent jobs and money today, while other potential energy sources represent jobs and money tomorrow. Suboptimal politicians often prevail nearly forever once they gain office and grab the reins of privilege, patronage and visibility. Mammals waited 100 million years to become the dominant animals on land and only got a chance because dinosaurs succumbed during a mass extinction. The turbines now have the wind in their sails. Wind power occupies a niche that could be filled by a more efficient and less environmentally deleterious technology. There it has become largely self-sustaining. There's something else, too. Wind turbines are highly visible. Building wind-farms is a statement about the commitment of society to an environmentally sound future. They make their supporters feel morally superior to their opponents, who can be dismissed as selfish Nimbys. The uglier the wind farms are, the more they ruin the environment, the better: for their very unattractiveness draws attention to the sacrifice that they represent. They are Gaia's temples. The clacking of their sails is like a prayer offered up to Nature to forgive our environmental sins. It's mad. Interest groups will always oppose and no-one likes things on their own doorstep, but if things go the way they are predicted to, it may come down to a matter of priorities. Probably best to sample all possibilities at the moment. Half-agree about wind farms, but not with your general discussion of the alternatives, considering in previous posts you have doubted that manmade climate change exists. For one, nuclear far from being "outdated" is probably our best hope at reducing CO2 in the medium term. The current generation of nuclear power stations are much safer than those that gave nuclear a bad name, but this technology is now smeared and supressed by green activists and fear-mongering journalism. We need a broad range of power generation methods so we are not reliant on a single point of failure. I like the idea of burning rubbish for energy, rather than driving it around country to be "recycled" when markets don't even exist the recycled material. I rather like wind turbines. I think they have a strange beauty. There's a heresy for you. I may not carry on thinking that if there are hordes of them, however. I am, & have long been into protecting the environment (not sure if this makes me "green" though), & examples like yours indicate why I am not a statist. Many, especially New Labour types (who are far more into statism & managerialism than protecting the environment), have the thought process "X is green, therefore the government needs to impose X now". The problems with this are threefold. 1. The government doesn't rightly know what is good for the environment half the time. 2. Nor does it care- meeting targets & having something to boast about, however meaningless in reality, come first. 3. The litany of government inefficiency, especially in this area, where they so often back the wrong horse, as also evinced by support for the Severn Barrage (to which I am certainly no friend), government subsidies for "biofuels" which are often worse than nothing, & the third runway shite which doesn't even pretend to be green. This puts people off conservation altogether, which is unfair as New Labour hypocrisy hardly discredits the original aims, but is understandable. Now, the main threats I can identify are runaway population growth, overdevelopment, emissions/pollution & waste. These can quite easily be solved without resort to authoritarianism by restricting immigration, sensibly applied external regulations on building in sensitive areas, & restrictions on emission & pollution. You can disentangle sensitive action, which doesn't require cumbersome state action, from whatever authoritarianism this government dreams up & you'll actually find the former more effective. The best weapon is always the willing support of local people who want to live in clean areas & have good open spaces for their children to play in. (Of course, energy efficiency in the home & the workplace is already being taken up by individuals & companies who can see the financial gains to be had). On a philosophical level, my interest in the natural world started early. I grew up in a very grotty area of Stoke. A lot of the people I knew didn't have cars, & I am the only person I know who was regularly taken to the countryside as a child. So I delighted in the views, the tranquility & that sort of shite in a way that far too many don't, & I am an advocate of opening up the country to them through schools & by organisations such as Kids Comapny & so on which organise expeditions to those who may otherwise remain ignorant of what nature has to offer. The difference between me & some types was really laid bare when a friend asked me "when I became interested in the environment" as if it were some hobby I'd taken up. In fact it was bred into me: I am not like the Islington luvvies who boast about how "green" they are, or the apparatchiks who can reel off how many targets they've imposed, but someone who has it in his bones. I actually think Cameron & a lot of his team are the same. In practical terms, I hope you see what I'm getting at, that a lighter touch & a working with people will work better than the Miliband way. I just hope he doesn't put too many people off the whole thing & lead them to scorn anything conservationist. In reality we should have options like nuclear on the table & shouldn't be wedded to wind farms or anything else. It is my humble opinion that we can make more than a few efficiency savings, as households are starting to do, & reduce our need for more, more, more of the same. A stable or slightly falling population also, to be achieved by "natural" means of letting our current fairly low fertility rates produce their effect. Probably not made any friends with the above. Well-sited wind isn't any more problematic than solar. As with many kinds of climate-dependent generation it can't be used to provide baseline power but that's no reason to suggest it can't be useful. Just because the grid at present is set up for supply to follow demand doesn't mean that this is the way things have to be, nor the way they should be. As more wind power comes on-line we're increasingly likely to see non-time-critical applications (of which there are an increasing number) take power when it's available, increasing the efficiency of turbines. Meanwhile, no serious proponent of alternative energy sources believes we can get by without a distributed mix of small-to-microgeneration and nobody would say that we should rely solely on wind. But at the same time, wind is a much more mature technology than the others you've mentioned and can be rolled out now. They might be "ugly" by some standards (I, personally, don't find them to be so) but they're a damn sight prettier than a fossil fuel power station, and it should be remembered that they're what would be built instead, not hypothetical wave or geothermal plants. I'm all in favour of pouring money into HDR and tidal generation, and think we should defund all the nuclear nonsense we're building in favour of such technologies, but that still doesn't change the fact that those technologies are, at present, not viable, wheras to a large extent wind *is*. McDuff: "wind is a much more mature technology than the others you've mentioned and can be rolled out now." That's partly my point. The fact that today it's more highly developed than other alternative technologies makes it a dangerously "easy" option for politicians to demonstrate their green credentials. But long term, it's by far the least efficient and least developable technology. Pouring resources into this dead-end takes them away from better technologies. The notion that steady incremental progress is being made towards cleaner generation is deceptive because the alternative on offer is a few more years of "dirty" generation followed by a "big bang" when advanced carbon-neutral generation comes on stream. That would produce much larger gains, long-term. lost causes: agree about the maligning of nuclear technology. It's certainly a better option than all those wind-farms. I saw an advert for M&S last night. Twiggy was standing in front of a wind-machine with some turbines in the background delivering a trite message about how M&S was good for the environment. If Roland Barthes were still around it would make a good subject for one of his essays. I think relying on a "big bang" is a dangerously technocratic option, and in any event even the most enlightened, calm and reasonable political party would have trouble planning an energy policy with that level of inbuilt downstream risk. "A few years" can mean five years or it can mean fifteen years. On the other hand, I simply don't get why on earth sane people think nuclear power plants are better than wind farms. 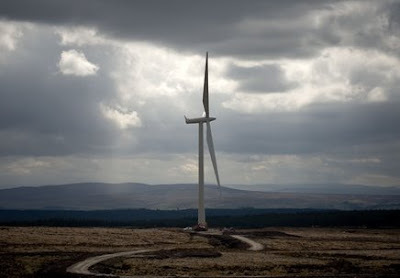 They're no prettier, they're horrendously expensive, they're only profitable if governments subsidise the dirtiest and most dangerous parts of the process, and they take ten to fifteen years and a billion pounds per plant - far more than wind farms. If you decide you don't like a wind farm you can just take it down and you've lost a couple of hundred grand - decide to shut down a nuke plant before its time and you wipe out another billion from the public purse. Nuclear represents technological lock-in to dirty and increasingly obsolete technology that relies on government subsidies for far, far longer than wind would. Wind, for all its faults, generates power here and now. New nuclear plants we start to build today won't come onstream for at least a decade. A *sensible* energy policy would be to realise that wind power isn't a silver bullet, but that it can be utilised in the short-to-medium term while the money that we would have spent building nuke plants was put into HDR research in the North-East and Devon. I guarantee you'll get more return from investment that way than if you build six or ten new nuclear plants based on other people's designs to sit there and chug away for the next half-century. @ McDuff: a couple of hundred grand? You must be joking. Billions are being spent on this erratic, overpriced and essentially otiose technology, for no discernible reason except that it has become an icon of green. Billions that can never be got back. The basic problem with wind farms, apart from the aesthetic dimension, is that it isn't windy all the time. So how do you generate the electricity when it's not windy, which is most of the time? You need conventional power stations. So the actual carbon savings, if any, are very small. Why not use geothermal, which involves little more than drilling a hole in the ground? It's cheaper, it's more environmentally friendly, it's available today, and it's far, far more reliable. The only thing wind power has going for it is that there's now a large industry devoted to promoting it. If that sounds like a conspiracy theory, call me Icke. Billions in total, per plant cost is three to twenty grand-ish a pop (depending on the size of the turbine). A wind farm itself is a fraction of the cost of a nuclear plant and can be taken down for the cost of taking it down. This is not to mention that domestic or commercial microgeneration can't use nuclear power but it can use wind turbines based on the same technology as the bigger ones. As I said, I'm well aware of the limitations of wind farms, but I also mentioned specifically that as we get more power available for non-time-critical resources we'll start to see more supply-led rather than demand-led functionality in the grid. As for geothermal, I think you're just demonstrating that you don't understand the technology. Standard geothermal, of the kind we can do already, requires there to be an existing supply of hot water at an accessible depth. This is why Iceland can supply almost all its energy needs from geothermal energy. Areas without existing hot groundwater, on the other hand, can't do it nearly as easily. I mentioned the technology in the last comment - "Hot Dry Rock" or HDR geothermal, which involves creating artificial fissures. It's not nearly as simple as "just drilling a hole in the ground". Which is not to say it's unviable, of course, by any means. At this stage the impediments to HDR rollout on a larger scale are engineering rather than scientific ones - the principles are mostly sound, it's just the implementation that needs to be tested and refined to make sure that it's safe, stable and economical. I absolutely support pouring money into this avenue of research so we can get HDR plants in this country faster than we otherwise would. But it's an absolute nonsense to suggest we can just drill some holes in the ground and mine energy like oil. As for your "conspiracy theory," perhaps the reason better renewable sources don't get the funding they need is nothing to do with the multi-billion pound wind industry and rather more to do with the multi-trillion pound fossil fuel and nuclear industries, all of which have considerably more toes under government dinner tables. Witness the boondoggle of "clean coal" which is currently being touted by the various Millibands of the government - technology which is troublesome, untested and newer than HDR, with similar "we'll fix it as we go along" style engineering issues, but which has the advantage of massive support from the government and its various wealthy backers. You don't need a "conspiracy theory" to follow the money. Wind power follows subsidies, that much is true, but so does nuclear and coal. Take the nuclear and coal subsidies out of the mix and put the money into renewable research and I bet you'd be amazed how these new technologies come on in leaps and bounds. Right-leaning, non-hippie, actual physicist Political Scientist has posted a good response to this piece. Also note that the carbon savings from an irregular energy source are still significant: the whole point about gas generation is that it's only deployed when required (whereas hydro generation, nuclear and coal run all the time as baseload). If it stops being windy, you can crank up the gas plants from 25% to max in a few seconds. Yes, that is quite an effective demolition job. Though I'm sure if I took the trouble to make myself conversant with all the facts I would be able to answer most of PS's points. I plead guilty to over-egging the rhetoric. But I really do think that the reasons for the concentration on wind power are partly psychological. It is because the wind-farms are so visible, and so invite loud opposition, that they seem virtuous to political leaders. There's a parallel with brutalist concrete architecture, which also seemed progressive and "modern" partly because it was so ugly. On the practical points, I think it's unarguable that wind-turbines are inefficient. Lovelock's figure, as I understand it, comes from a 2005 German report which concluded that the savings from wind-farms were more than offset by the increased inefficiency of conventional power-stations which they supplement. The central point of my argument was actually the quote from Gould. My suggestion is that wind power is diverting resources from potentially more efficient forms of carbon-neutral energy because it got there first, has high visibility and so much investment has already gone into it. Obviously, it offers more generating capacity today than the alternatives. The question is, though, whether if resources were switched from wind-power to the alternatives, would there be more or less capacity twenty or thirty years down the line than there would be if we continued privileging wind-power over other renewables. My guess - and I'm afraid it is only a guess - is that the answer is that there would be more. But that's a false dichotomy. Even in a theoretically perfect apolitical state where efficiency is prioritised over political expediency the choice wouldn't be between wind turbines now or tidal power in 30 years. Picking on wind as opposed to nuclear or "clean coal", both of which are far more costly and dirty, smacks of a particular ideological blindness - the very thing you've imputed to people who build wind turbines, in fact. It's "unarguable", by your reasoning, that coal is inefficient, and that making it more inefficient by cleaning it up is probably a bad idea. It strikes me that of all the silver bullets the government is wasting the green pound on when they're not funding HDR, tidal power, and a big fat HVDC transeuropean power grid to pipe solar energy from the Sahara, wind power is one of the least offensive, which does invite queries about why you're picking on wind *specifically* rather than quasi-environmental boondoggles in general, I think. justify why I have chosen not to believe your refutation of my argument" is a spectacularly audacious tack to take here, and I commend you for it. Not many people would have the stones to throw that in there with a straight face - well done! Is nuclear power really the busted flush some make out? A lot of research has been done - notably in India - into the use of thorium in reactors. Thorium is much more abundant than uranium, and - you guessed it - India has rather a lot. Then there are breeder reactors, and the possible use of Carlo Rubbia's energy amplifier system to destroy high-level waste while producing energy. All of this is in the realm of 'theoretically possible', especially Rubbia's concept, but shouldn't be dismissed out of hand. Having said that, I thought Bob Peck was brilliant in Edge of Darkness and that does tend to colour my view of things a bit. The trouble with nuclear isn't that there aren't many "theoretically possible" ways of making it work. It's that the economics of the situation simply don't work unless you're committed to the idea of nuclear in the first place. If you're into "theoretically possible future energy sources", the maths on geothermal and solar look a lot better than nuclear. Morover, nuclear tends towards huge chunks of commitment to infrastructure investment and limits national/international energy strategies to vast long-term commitments to a particular technology. Renewables - even large-scale ones, tend to be much more easily included as part of a mixed strategy. It's a good idea for governments as well as private investors to not put all their eggs in one basket. The whole argument about methods of generation is itself a red herring as it is based on the concept of "predict and provide". This is a concept that has already allowed the "autogeddon" of our traffic-clogged island, and the disaster that is the over-blown aviation industry. What is needed before we discuss methods of generation is demand management, reducing and setting limits on consumption. But of course that would require a government that was willing to govern! It's not an either/or proposition. Good energy policy will reduce demand and change the mix of sources that energy comes from. Microgeneration and efficiency is an absolutely vital part of every sensible energy consultant's plans I've read. But with the best will in the world there are limits to what government can do with a swelling population and a growth-based economy. Now, if you were suggesting that Labour should have challenged the growth-centricity of the capitalist market-based economic doctrine, I'd think you were onto something. But without such a radical step I don;t know how you think they could stop the swell of demand much more than they already have. Also, I don't know how you think they'd have got elected if they had done that, so it's probably still the fault of us damned voters. Everybody engaged in this debate should read David MacKay's book "Sustainable Energy - without the hot air". He clearly shows that none of these proposals - wind, wave, solar, nuclear, clean coal, etc - provides a solution on their own. What we need is an overall policy for low-carbon energy that adds up, i.e. where supply meets demand. Nuclear is a good short term engineering solution. We can do it now and it doesn't require any advances in science or engineering to make it viable. Its clearly not cost-efficient once you take into account the waste storage but dangerous climate change would be even worse as would the collapse of the modern world which relies upon electricity. Maybe 20 years ago we as a world could have prevented climate change without building nuclear power stations but as of today its simply not a viable option. The missing piece of the puzzle is an international power grid so that for example when the wind is blowing on the UK wind farms we can sell power abroad then when its not enough we can buy in solar power (or whatever) from the Sahara or something. The hardest part for me will be that we the British will just have to grit our teeth and vandalise the Seven Estuary even though it is undoubtedly a priceless natural resource and vital biodiversity preserver. Its a terrible thing to do but I can't see how it can be avoided without paying a much higher price. The Heresiarch said... My suggestion is that wind power is diverting resources from potentially more efficient forms of carbon-neutral energy because it got there first, has high visibility and so much investment has already gone into it.. The important word there is 'potentially'. Fusion is 'potentially' more efficient and carbon-neutral but its not one today. And we have to do something today, not tomorrow, not next year, not in a decade, not in a generation but today. Now. We can do the wind power now. If solar or hydrogen or biomass ever makes a breakthough and becomes a better solution then we can switch over to that. The time of listening to scientists and researchers has passed. It is time for the engineers to build us the best fix that can be made with the technology that is working and reliable today. WML - solar is near as dammit now. It's certainly a lot more technically viable to set up a thermal solar powerplant than it is to try and build a "clean coal" plant. And as far as nuclear goes, I think it's pushing the idea of "now" a touch. The current crop of nuke plants we're intending to build, with taxpayers subsidising the dirtiest, longest term bits of the process in order to make the process at all economically viable for private investors (where have we heard that before?) won't be coming onstream for a decade, with some being switched on as late as 2028. Once there, we have a commitment to run them for half a century. A nuke-based strategy locks us in to that particular energy mix until this century, which has just begun, will be nearly over. I can't see how that is a good thing. I am suggesting that Labour (or anyone else for that matter) should have challenged the growth-centricity of the capitalist market-based economic doctrine, and also the swelling population that you mention. The problem with "predict and provide" (apart from the fact that it is an abdication of the duty of government to govern) is that the "prediction" is based on the assumption that our wasteful destructive "consumer capitalist" lifestyle, and untrammelled population growtn can continue unabated. This assumption is clearly untenable. The world's resources of raw materials are rapidly running out, as are the most basic resources of land and water. All over the world the eco-systems that support life are suffering damage and collapse. Apart from a few lonely voices crying in the wilderness no-one is monitoring the cumulative aggregate effects of this, (probably because most scientists are specialists - people who learn more and more about less and less), but it is only a matter of time before the damage reaches a critical mass where large scale extinction become inevitable. There are no technical fixes. Technology, man's meddling and tinkering with natural processes, is what has caused the problems, it cannot solve them. Only a major and drastic change in our lifestyles can give any hope to us, the planet, and most of life on it. If we don't do it for ourselves nature will do it for us - but we won't like the way she does it! A government with vision would have used the recession and the collapse of a part of the capitalist system to start gently bringing about these changes, but what did "New Labour" do? - as the good Archbishop said "like an addict returning to the drug...."
Well Keith, if you don't like meddling with natural processes then why not try living without electricity? And don't have anything to do with medicine, vaccine, preservatives, disinfectants or the rest but positively welcome good hearty natural things like tapeworms, diptheria, smallpox, tuberculosis and all the other horrors that 'meddling' has rid us of. You'll excuse us I am sure while we do not join you. And don't go helping yourself to any of the nutritious but highly meddled food crops or farmed animal products of course as they are very unnatural but instead live out a stone age hunter-gatherer lifestyle (nasty, brutish and short) and make the most of your life expectancy of around 35. Enjoy the starvation - its very natural. Please don't concern yourself with the billions of people lifted out of poverty by the very self same capitalism you affect to despise. Not should you feel any empathy to the billions of your fellow humans saved from starvation by evil meddling scientists. There is a blog called commentisfree on the guardian.co.uk website that positively welcomes contributions such as yours. Doubtless you will go down very well over there and get lots of recommendations and find fellow spirits galore. McDuff said... WML - solar is near as dammit nowIt may well be only a few years before the great breakthrough so long predicted arrives. Let us hope so. But you are supporting my point that solar is not ready today. We don't have the luxury of fiddling while Rome burns and must use the technologies to hand. You and Heresiarch are like those people who never buy a new phone or laptop because you always have your eyes set of the vapour-ware being dangled in front of you and promised for "soon". Far better to have the current technology and upgrade down the line when something worthwhile appears and works. Otherwise you just drift on for years with an old inadequate technology chasing mirages. Well Keith, if you don't like meddling with natural processes then why not try living without electricity?. Yeah Keith, if you don't like pointless strawman arguments, don't come into threads like this! Growth-centric economics is unsustainable in the long term. This is because the planet is finite. It's not even difficult maths. Jumping on people who say that there is a difference between "finite" and "infinite" as if they are suggesting that we all go and live in caves is just puerile schoolyard nonsense. t may well be only a few years before the great breakthrough so long predicted arrives. Let us hope so. But you are supporting my point that solar is not ready today..
What big breakthrough? I'm talking about solar stirling engines which are in production right now! It's not even as far away as HDR, which is sound science with some engineering kinks to work out. Solar thermal is sound science, pretty robust engineering, it's just an economic issue to get production capacity ramped up. That's far better shape than Clean Coal, but one's getting billions of pounds of subsidies and the other one is getting lots of phnarr phnarring about how it's Not Quite Ready yet. Thank you, McDuff, for supporting my point that the resources of the planet are finite. As to "pointless strawman arguments" and abuse I am unphased by stuff like that, I have heard all the ill-thought-through cant before, and doubtless will again. For the record I have at times in my life lived for periods of several years without electricity, and would be perfectly happy to do so again. That does not mean that I am asking everybody else to do so, but as with all resources, there is a difference between sensible use and extravagant waste. Keith said... Thank you, McDuff, for supporting my point that the resources of the planet are finite. Finite they may be, but still incredibly large and not likely to be a limiting factor before Homo Sapiens has evolved into something else in a few million years time. Other glib truisms include the observation that water is wet, sky is blue and that space is deep (one for the Hawkwind fans there). Keith said... For the record I have at times in my life lived for periods of several years without electricity, and would be perfectly happy to do so again. Did you really live without any of the indirect benefits of electricity? No fuel oil, no hospitals, no medicines, no food other than what you have actually grown or raised yourself? That is quite an achievement in this day and age in any part of the world let alone in the UK. Without electricity nothing in the modern world works. If there was a big solar storm it could wipe out the electrical grid and people in the USA & Europe would die by the tens of millions. Its quite possible that the USA in particular would never recover again. McDuff said...What big breakthrough? I'm talking about solar stirling engines which are in production right now!. And they probably work just fine in sunny California but they're not ready for the UK. Wind turbines are. We have lots of wind here, especially offshore. Wind is the technology we have today that works here in the UK today. McDuff said...That's far better shape than Clean Coal, but one's getting billions of pounds of subsidies and the other one is getting lots of phnarr phnarring about how it's Not Quite Ready yet.. I'm not wild about China building new coal-fired power plants either but they are at least shutting down old ones that were even more polluting. All those who want to wait a few years for solar power generation to be feasible in the UK are presumably quite content for some shiny new coal-fired power stations to be built to tide us over? Presumably you regard that as a price worth paying to stop the wind farms lest they actually deliver some clean(ish) energy. Finite they may be, but still incredibly large and not likely to be a limiting factor before Homo Sapiens has evolved into something else in a few million years time..
You sweet, naive child you. Under normal circumstances we've already hit significant limits with current arable land. The intensively monocultured agriculture we're trending towards to meet the growing population is increasing basic caloric yield, but at the cost of susceptibility to disease and massive environmental impact, particularly with meat production. Balancing how to feed people, particularly meat-loving westerners who don't wish to pay what food costs, with how to preserve land for the future is already a pressing concern. ...which, of course, is increasingly difficult to find, which is problematic because the world's transportation infrastructure relies very heavily on it. US domestic peak oil has come and gone. Resources like oil shale and tar sands are there, but they are only economically extractable when oil prices creep higher than the world is comfortable with, which of course will stifle demand. The reason we fight to many wars in oil-rich nations now is because "energy security" relies heavily on a resource which, optimistically, we have 200 years left before we run out, which of course means increasing scarcity long before that point. Realistically, of course, people accurately point out that we are already seeing the shocks caused by the upcoming scarcity. In other words, I don't know what bizarro universe you live in where the natural resources available on this planet are so abundant that we can safely evolve past them without worrying. We are currently experiencing scarcity. How fast do you think we're likely to evolve? There has been no shortage of food since the Green Revolution or drinking water. When people go without it is due to povety not a supply side limitation. It is only relatively recently that most Homo Sapiens stopped experiencing scarcity. Starvation was a regular, natural and normal experience until the evil scientists started 'meddling with nature' much to some people's annoyance. I often think a sustained period of starvation would be highly educative for these fellow-travellers who have infiltrated the 'Green' movement. Since we've not yet had any wars in the C21st over oil this prediction is probably safe. Religion will most likely continue to be the main 'Causus Belli' I'm afraid. Platinum on the other hand is something that there is not nearly enough of in the world. Its a real shame because it makes a Hydrogen Economy unworkable with current technology since there isn't anything like enough Platinum to make enough fuel cells to replace petroleum. Happily there is a large fusion reactor about 8 light-minutes away that supplies 3,850,000 exajoules a year at 174 PetaWatts (source wikipedia) which should be enough to meet humanity's needs for the foreseeable future. Not all of that is available and 'only' 87 PetaWatts actually reaches the surface. "Since we've not yet had any wars in the C21st over oil this prediction is probably safe." Its nice to know that there is still ONE person in the world who believes the Iraq war was about toppling a nasty dictator and freeing those poor Iraqi people! Oh Keith, you don't understand. Bad things that happen are because of religion. That's how it works. All wars are religiously motivated, even the ones that happen conveniently in the same place as scarce resources. People never actually fight over stuff, after all, only over beliefs. But then since resources aren't scarce I suppose that's a contradiction. There's more than enough water to go around but it's just too expensive for everyone. Which is a weird kind of Marxism, I suppose, I dunno where that comes from. Half-reading Amyarta Sen, I guess. Also, the magical thing about science is that it can always get more output from the same inputs with no downside. Except not magic, because belief in magic is irrational. Totally logical, that's what I meant. Efficiency can always Distribution doesn't matter. There's no such thing as a bottleneck. Nothing is complex. That's absolutely scientamifical that is.